Kempo literally translates from Japanese as Fist Law. Its meaning can be traced back to what is called the mudra, which are hand postures. Each of Kempo's hand postures represent both the physical and the spiritual realm. These realms are inexorably linked. Kempo itself is an entity. It is not a style of martial arts or a form of techniques. James Mitose Sensei, explained that Kempo is a philosophy. Mitose brought Kosho Shorei Ryu Kempo from Japan to the U. S. Kosho is a philosophy of growth, of study, and of struggle. The martial arts become simple, even self-evident, through understanding the process of growth, study, and struggle. Within Kosho Ryu Kempo, there are many sub-arts of study. The purpose of the study of various different art-forms is to learn to see the similarities in all of them. Three general categories of study are the healing arts, the cultural arts, and the martial arts. The study of healing arts reveals a relationship with the martial arts. The martial arts would be looked upon as healing arts from the point of view of a practitioner who wishes to simply study from the martial standpoint. The cultural arts play the same role. Part of the study of cultural arts is the study of history. History must also be studied in the martial and healing arts. Language is also studied from all perspectives. The study of the Japanese language creates the ability in the disciplined student of Kosho Ryu to be able to understand the history and cultures of other people. This in turn ties in with the philosophy of looking for similarities, ridding themselves of prejudice and conflict, and creating happiness and peace in their lives. Each of the many sub-arts of study in Kosho Ryu eventually intertwine. 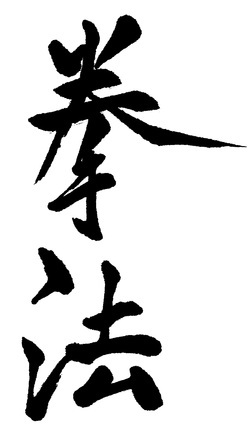 Aruki waza, for instance, which is a combative technique involving proper posturing toward an opponent in bujutsu, is also utilized in the studies of swordsmanship, shodo (ancient Japanese brush calligraphy), and healing arts. This type of lesson initially brings students to confusion. Eventually, it allows them to understand Mu, nothingness. That is the purpose of the study of Kempo in Kosho Shorei Ryu. Once that is accomplished, one sees everything, and at the same time realizes that it is really nothing.